Want to write about your recent ancient history travels? Share some awesome images of the ancient Babylonian art you took or review a Viking exhibition you just saw? Then you have come to the right blog. Ancient History ETC (AHetc) is the blog of Ancient History Encyclopedia and our content is all about ancient history from today’s perspective. It also happens to be image driven, engaging and easy to read. 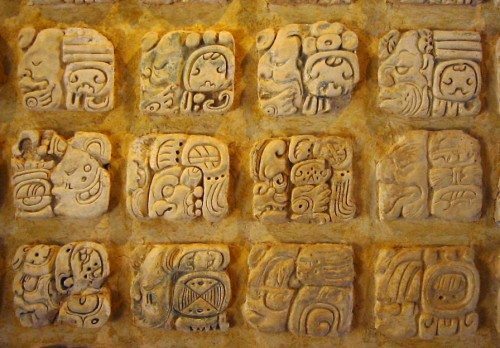 Examples of glyphs used in the Maya writing system. Maya glyphs are placed in columns and are read from left to right in rows of two. From the Archaeoloigcal Museum of Palenque, Mexico. Photo © Kwamikagami. Anyone! All of our content is produced, edited, and published by volunteers, so why not join the team? Reach an audience: No other ancient history publication can give you as many potential readers as we do. Raise awareness: A large number of our readers are history enthusiasts from all over the world. Each one is eager to learn and share information about ancient history! Educate: Many teachers and students use our site. By writing for us, you help the world learn about history and different cultures. Build your portfolio: By getting published with us, you can add an article in a reviewed & respected publication to your portfolio. Please read our style guide and how to evaluate online sources before submitting.